Your vehicle is insured up to € 200,000 during the transfer of our business liability. Our carpark is secured by the security service Securitas. Fly more often, then call us and take advantage of our PARKFLAT offer. No more searching for a parking place! When leaving the airport, you drop off your vehicle directly at the terminal and return it directly to Terminal B-C on your return flight. 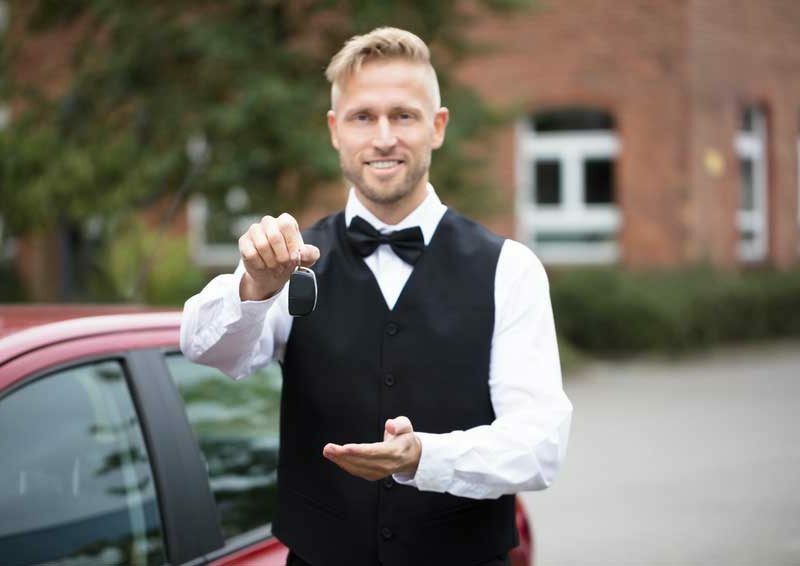 Until recently valet parking was almost exclusively provided by hotels or restaurants, which means that an employee would take care of the vehicle. This is what the Düsseldorf Airport is offering now. Everyone can just drive up to the terminal and the staff will take care of the car. When you get back your car will be awaiting you at the terminal. Of course the car is insured on the way to the parking deck and also back to the terminal. The staff is trained specially for this purpose. So no annoying heavy lifting or looking for a free parking space. A short step by step explanation how the valet parking works will you find here. Naturally everyone could just park there car at the parking deck and take the shuttle service to the airport. The shuttle service is not a public-transit bus. It only gets booked if a customer asks for it. So when you return a simple phone call will be enough and the shuttle will take you to the parking deck. Here too your car will be monitored. No client will have to stay the night to get back to his car because the shuttle is a 24 hour service. A short step by step explanation how the shuttle service works will you find here. In addition to the parking service the customers are offered an individual car wash. We will clean the car inside and out. 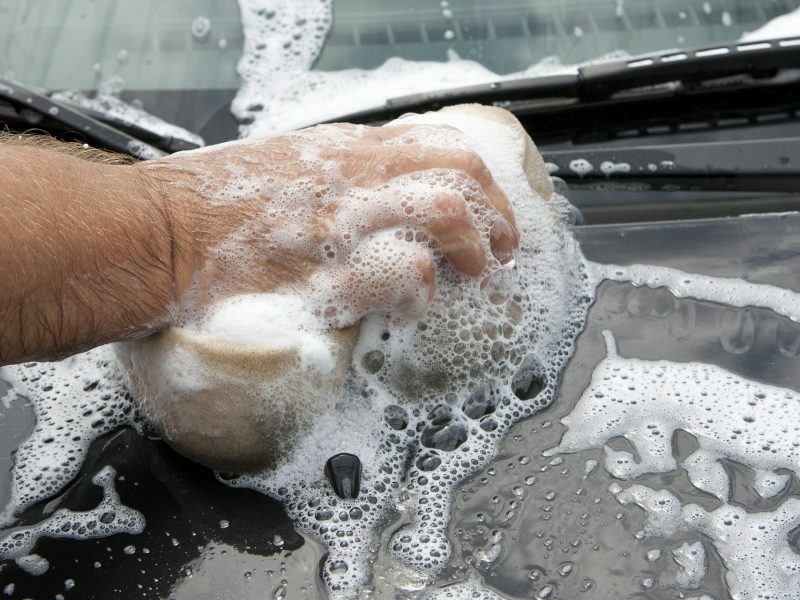 We include hand wash, polish, leather cleaning and much more! Please read our individual car-cleaning-program. Click here to get to our offerings. Everyone who is travelling by plane got the same problem. To get there you have to take the train and that is stressful and takes ages. Direct connections are rare or there are none at all. So isn’t it much better to take the car and park it at the airport? Up until now it wouldn’t be a possibility or it would be quite difficult to even get a parking space. This is different at the Düsseldorf Airport and most importantly not too expensive. So it pays off to fly from the airport in Düsseldorf because here you don’t have to look for other ways to get to your plane in time. Especially when your travelling with the entire family and have a lot of luggage. Of course there won’t be an extra fee if there is a booster seat or some luggage left in the car. To park at the airport or somewhere close is just a very good and additional service, mainly because it’s not to pricy and to buy a train ticket can be quite expensive. So everybody can think about how to park their cars. Everyone can decide for themselves if their would prefer valet parking or to just take the shuttle. Both options guarantee you a 24 hour safety for your car.